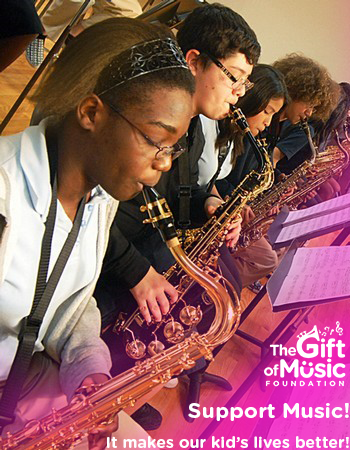 The Gift of Music Foundation is a nonprofit organization that relies on a variety of funding sources to ensure that we can continue to make music accessible to underserved children. As our program grows to include more music educators, more musical instruments and more students in these after school classes, we need your help. For just $20, you will be sponsoring 1 child to participate in our music program and enjoy access to an instrument, instruction, and music for an entire month. Give that same $20 each month as a “Sustainer” and you ensure that this student has the gift of music for the entire school year! Our After School program operational costs vary depending on the number of students enrolled, the number of instruments required and the number music teachers per program. A typical After School Program consists of up to 30 students, 2 music teachers and 20+ instruments. The costs associated for activating our program in new schools in under-served neighborhoods range from $3,500 to $5,000 per semester, or $7,000 to $10,000 per school year. Pledge a one time or recurring gift of any amount and help us make music education accessible to children one child at a time. Give the gift of music. The Gift of Music Foundation is a 501(c)(3) tax­ exempt organization and donations are tax­ deductible to the full extent of the law. Consult your tax adviser for specific questions about your deductions.